What does it mean to follow the Bible? The book is thousands of pages long, full of contradictory information and written in a really small font. How can anyone be expected to obey all the rules? Well, Esquire writer A.J. Jacobs tried. For one year, Jacobs lived according to each and every rule in the Old Testament. He grew a beard. Tied strings to his clothing. Made sure not to wear blended fabric. He even beheaded a chicken. The best part of his religion binge comes when Jacobs tries to obey an obscure rule found in Leviticus 15:20: "Everything upon which [a woman] lies during her impurity (meaning, menstruation) shall be unclean; everything also upon which she sits shall be unclean." During a certain time of the month, Jacobs can't touch or sit on anything his wife has occupied, not even in their own apartment. His wife finds this so irritating (apparently women don't like to be called unclean) that she makes a point to sit on every conceivable surface in their home, and Jacobs is forced to purchase a portable stool. 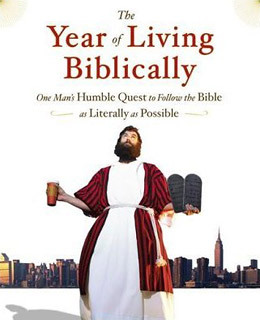 The book's title is a bit of a misnomer; Jacobs is Jewish and says he cannot obey the New Testament because it commands him to believe in Jesus. So when he gets to that part of the Bible, he opts for a more embedded-journalist-on-a-mission approach, and simply meets and interviews interesting groups of Christians (i.e., Jerry Falwell's church). But who cares? This is a man whose wife made him sit on a stool.